Ford India has launched the second generation 2015 Ford Figo hatchback at the prices mentioned below, ex-Showroom, New Delhi. The new Figo is available with three engine options. The 1.2-liter Ti-VCT petrol, the 1.5-liter Ti-VCT petrol exclusively paired to the 6-speed Powershift automatic and the 1.5-liter TDCi diesel engine. The ARAI-rated fuel economy for the 1.2 petrol stands at 18.16 km/l, whereas that for the diesel is rated at 25.83 km/l. Even the Base variant gets a driver airbag as standard. The 1.2-liter petrol is rated at 88 PS and 112 Nm, the 1.5-liter petrol at 112 PS and 136 Nm and the 1.5-liter diesel at 100 PS and 215 Nm, identical to the Figo Aspire. The new Figo measures 3,886 mm in length, 1,695 mm in width, 1,525 mm in height and 2,491 mm in wheelbase. It has a ground clearance of 174 mm and boot space of 257 liters. The Figo shares its wheelbase dimension with the Aspire. The Base variant of the 2015 Figo gets a driver airbag, whereas other trims get dual front airbags, or 6 airbags in case of the top-end Titanium+ variant. 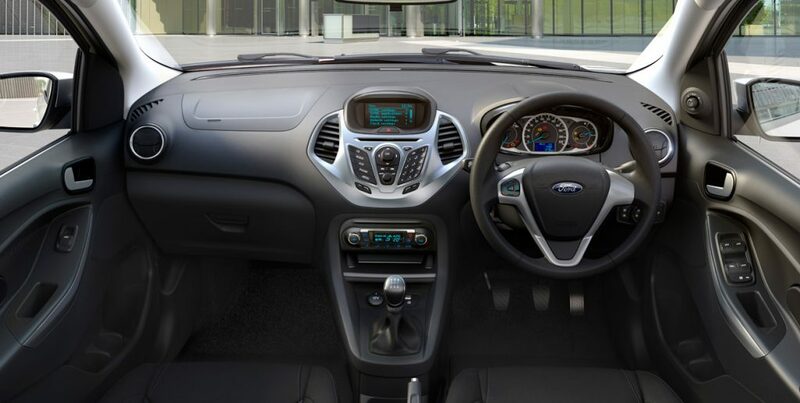 Other features are carried over from the Aspire and include ABS, EBD, Ford's SYNC with AppLink with a 4.2-inch MFD screen, Bluetooth, CD/MP3/USB/AUX-in, 4 speakers, Ford's MyKey, perimeter alarm, Auto AC, electrically adjustable and folding wing mirrors, alloy wheels, and ESP with Hill Hold in case of the AT variant. The new Figo is available in 7 colors.